Hi, my name is Jamie. My dermatographia started when I was six years old. My parents assumed it had to do with laundry detergent, shampoos, etc. We tried everything. I went a whole year using only oatmeal-based shower and health products until we gave up on the idea of my dermatographia going away. I was always insecure about it, and to be honest I still am. My skin blemishes and bubbles when getting dressed, popping pimples, shaving. Basically, all the time. In school I just try to hide it, but I know there must be another kid in my school of 4000 with the same problem. I’m only fifteen, so I hope this won’t follow me forever. That I know of, I’ve only ever met one other person with dermatographia. My parents tell me I have it because I’m insecure. I argue it’s the other way around! I’ve always been afraid to fool around with a guy who freaks when they see my naked skin, scratched and red, puffy. In the end, though I know I can’t let my skin control me. Thanks. Thanks for the email Jamie! 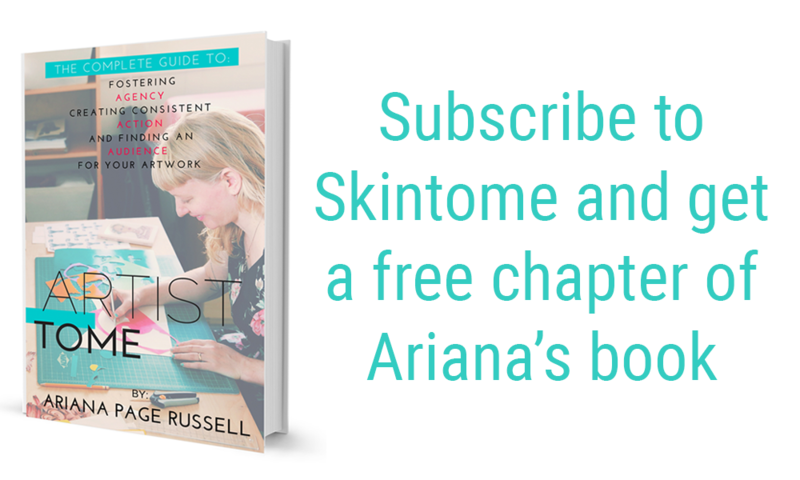 I am truly moved that you decided to share this with me, and readers of Skin Tome. My suggestion to everyone with dermatographia is that we transform the way it’s viewed. Instead of it being an embarrassing condition, make skin writing a cool condition! We are lucky to have something that makes us unique, and it’s possible to find inspiration in this supposed flaw. For instance, rather than hiding your dermatographia, start making drawings on your arm and showing people the cool stuff you can do with your skin. Have fun with it! 1. Ask someone to play tic-tac-toe, and offer to use your arm as the game board. 3. Make crazy patterns on your leg. 4. Draw a portrait of your pet (or a friend’s pet) on your stomach. 5. Ask a friend or family member to draw on your back and then take a picture so you can see it. Share some other ideas below! Sometimes I draw scales on my arm. That’s a great story! Thanks for sharing. I’d love to see some of your drawings. Thanks for the story! That sounds like a mean bully. Hopefully now everyone can see that dermatographia is cool, and NOT a contagious skin disease! Hi I’m Jacinda, and I’ve Dermatographia all my life, my parents thought it was because I was allergic to my fingernails some how, but they noticed that I got bumps and stuff when I was hit, we went to an allergy specialist when I was about 7-8 and it wasn’t just allergies, though I didn’t learn the name of this condition till much later, I have Dermatographia. Sometimes it’s irritating because I can’t itch without getting huge welts over my arms or face, and EVERYONE always gets so freaked out about it. “Jacinda what’s wrong, why is your arm like that?” “Do you need to go to the nurse?” “Is it contagious?” And then comes a long winded explanation. Sometimes I have fun with it though, I’ll draw hearts on my hand or cool things that make my hand look stitched up and it’ll look like some kind of crazy tattoo, so it’s a blessing and a curse. Thanks for sharing your story Jacinda! Hi Jamie, I have read your post and It is really inspirational to see your positiveness towards this disease demographic and making fun from it. As we all know, this is a life long ailment and sometimes it irritates a lot. I have passed through a lots of treatment but useless. I came to know about my disease 2 days before. In my condition, it disappears after a short span of time. Thanks Jamie for sharing your personal experience with us. Thank YOU for the nice comment! I’ll make sure Jamie sees this. Hey, my name is G, I’m almost 14 and i was diagnosed with dermatographia about 6 months ago! I instantly took it as something cool and I drew on myself ALL THE TIME. Then the teachers started telling me that it was weird and I should stop, and soon the students did too. Now I really don’t enjoy it and it seems to be getting a lot worse. Any tips for helping it go away? Hmmmm, I say ignore them! It’s not weird, it’s actually very common and a lot of us have found relief in having fun with the condition. So if you like drawing on yourself, then don’t let anyone tell you not to. Maybe just do it a little less? (rather than all the time as you said).